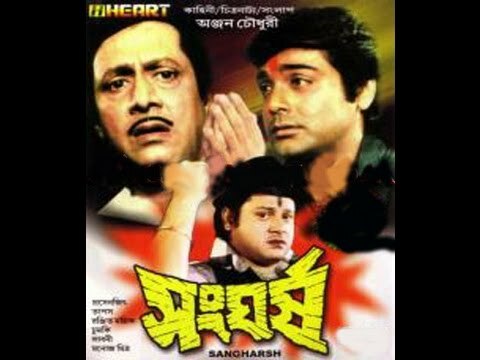 Star cast: Ranjit Mallick, Abhishek Chatterjee, Chumki Choudhury, Rina Choudhury, Subhendu Chatterjee, Sabitri Chatterjee, Rabi Ghosh, Anup Kumar, Ranjan Bhattacharya, Alaka Ganguly, Chadu Chowdhury, Rini Pal. ‘Geet Sangeet’ is the story of Ranjan, the son of a rich father who loves music. He neglects his business responsibilities for music and this leads to a tiff with his father and he leaves home to prove that music is stronger than money. He starts working as a driver in a lawyer’s house. Seema the elder daughter of the lawyer and Rekha the younger daughter both fall in love with Rocky aka Ranjan. Seema tries to sacrifice her love for Rekha but when Rekha finds out she sacrifices her love and unites Seema and Rocky.Seema’s father also approves of the match as Rocky is a good singer and decent. Circumstances reveal that Ranjan’s father is the friend of Seema’s father and Ranjan and Seema’s wedding was already finalized by them. All of them are happily united.